The island of Delos (Greek: Δήλος, Dhilos, meaning "clear," or "brought to light") is in the center of the roughly circular ring of islands called the Cyclades, near Mykonos, off the coast of Greece. It was once a major religious site, as well as a vital center of international commerce. Delos was already a holy sanctuary by the tenth century B.C.E., long before Olympian Greek mythology made it the famous birthplace of Apollo and Artemis. Its highest point, Mount Kynthos (Cynthos), is also crowned with a sanctuary of Dionysus. 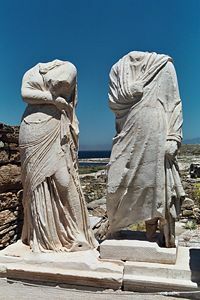 Legend states that Delos, the island of sun, appeared from amid the waves when the pregnant goddess Leto, who was being pursued by the jealous Hera because of Leto's affair with Zeus, took refuge there and brought her twin children, Apollo and Artemis, into the world. Delos is a 15-square-mile island, rocky and barren, where light dominates from the first moments of the breaking day until dusk. There are neither high mountains, nor the shade from trees, to shut out the light's perfect reflection. The ruins of the Delos settlement—the surviving marble columns, marketplaces, the amphitheater, temples, the gymnasium, as well as numerous the pieces of important mosaic artwork—are spread about all over the island, giving testimony to the island's glorious history. 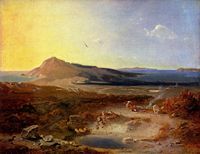 The island of Delos, by Carl Anton Joseph Rottmann, 1847. The island's first inhabitants were Carians, whose settlements date back to the third millennium B.C.E. Thucydides identifies the original inhabitants as piratical Carians who were eventually expelled by King Minos of Crete. After the Ionians had arrived on the island in the beginning of the tenth century B.C.E., Delos was transformed into a religious center, developed commercially, which increased its political influence. By the time of the Odyssey, the island was already famous as the birthplace of the twin gods Apollo and Artemis. Indeed, between 900 B.C.E. 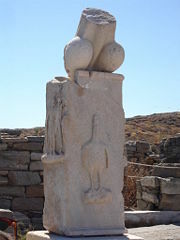 and 100 C.E., Delos was a major cult center, where Dionysus is also in evidence as well as the Titaness Leto, mother of the above mentioned twin deities. By the middle of the sixth century B.C.E., Athenians dominated Delos, together with most of the Aegean Islands. In the fifth century B.C.E., during the sixth year of the Peloponnesian war and under instruction from the Delphic Oracle, the entire island was purged of all dead bodies. It was then ordered that no one should be allowed to either die or give birth on the island due to its sacred importance and to preserve its neutrality in commerce, since no one could then claim ownership through inheritance. Another expression of Athenians' religious respect toward Apollo, was the festival which was organized in honor of the island's god every five years. 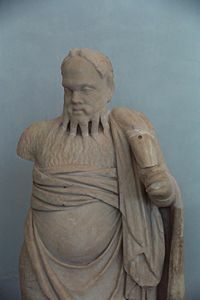 After the Persian wars, Delos became the meeting-ground for the Delian League, founded in 478 B.C.E. The congresses were held in its temple, with a separate quarter reserved for foreigners and the sanctuaries of foreign deities. The League's common treasury was kept here as well until 454 B.C.E. when Pericles removed it to Athens. Delos' imposing houses with courts and atria were adorned with impressive mosaics and mural decorations. However, the island had no productive capacity for food, fiber, or timber, requiring its importation. Limited water was exploited with an extensive cistern and aqueduct system, wells, and sanitary drains. Various regions operated agoras (markets). The largest slave market in the larger region was also maintained here. Athenian control over the island ended when the Macedonians arrived on Delos in 315 B.C.E. Their presence signaled the island's independence and its commercial growth and wealth. Delos was later conquered by the Romans who declared it a free port, transforming the island into an important trade center drawing Egyptians, Syrians, and Italians. During the war initiated by King Mithridates VI of Pontus (88 B.C.E. 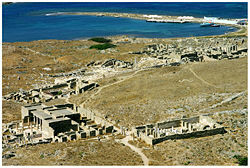 ), Delos was attacked twice resulting in the island's depopulation and eventual abandonment. From the seventeenth century, an increasing number of European travelers visited Delos, sketching its ruins and recording information on the site. In 1873, the Ecole Française d'Athenes began official excavations on the island, bringing to light a large sector of the once large and affluent city with its sanctuaries, harbors, market places, and residential quarters. The Lions' Terrace in Delos. The Temple of the Delians is a classic example of the Doric order. The Minoan Fountain was a rectangular public well hewn in the rock, with a central column. 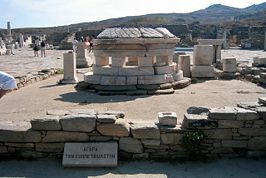 It formalized Delos' sacred spring, which was reconstructed in 166 B.C.E., according to an inscription. Water can still be reached by a flight of steps that fill one side. The Hellenistic Agora of the Competaliasts was a market square near Delos' harbor. Two powerful Italic merchant guilds dedicated statues and columns there. The Terrace of the Lions, dedicated to Apollo by the people of Naxos shortly before 600 B.C.E., had originally nine to 12 marble guardian lions along the Sacred Way. The lions create a monumental avenue comparable to Egyptian avenues of sphinxes. The Hall of the Poseidoniasts of Beirut housed an association of merchants, warehousemen, ship-owners, and innkeepers during the early years of Roman hegemony, in the late-second century B.C.E. The platform of the Stoibadeion dedicated to Dionysus bears a statue of the god of wine and the life-force. On either side of the platform, a pillar supports a colossal phallus, the symbol of Dionysus. The southern pillar, which is decorated with relief scenes from the Dionysiac circle, was erected c. 300 B.C.E. to celebrate a winning theatrical performance. The Doric Temple of Isis was built at the beginning of the Roman period to venerate the trinity of Isis, the Alexandrian Serapis, and Anubis. The Temple of Hera, c. 500 B.C.E., is a rebuilding of an earlier Heraion on the site. The House of Dionysus is a luxurious second century private house named for the floor mosaic of Dionysus riding a panther. 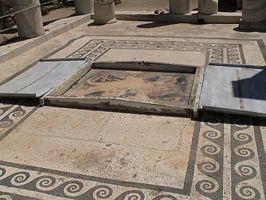 The House of the Dolphins is similarly named from its atrium mosaic, where Erotes rode dolphins; its Phoenician owner commissioned a floor mosaic of Tanit in his vestibule. Lacombe, Aimee. Delos, Island of Light. Fern Canyon Press, 1998. Grisel Gonzalez, 2000, "Delos" www.grisel.net. This page was last modified on 6 November 2017, at 23:00.